We all make mistakes in our relationships, and sometimes we desperately need to turn things around and make everything alright. Looking for forgiveness is a difficult situation and very hard to achieve the wanted result. The first step is to say clearly and sincerely “I am sorry”. To get help and find unique text sorry messages and images to share, check the following list and you will find the one that will speak straight to his/her heart. ♥ As I watch you walk away, I’m praying that you will find the way to forgive me and the path that leads you back to me. I miss you and I need you in my life baby. 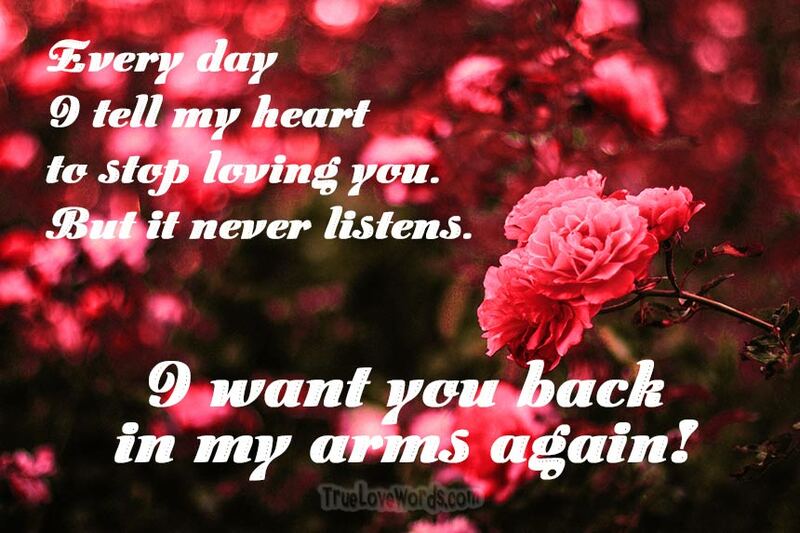 ♥ Every day I tell my heart to stop loving you. But it never listens. I’ve made mistakes, but I’m really sorry. I want you back in my arms again! ♥ My soul is dry and aches for you. I pray for the blessings of your love to rain down on me again. I didn’t mean to take you for granted. ♥ I deeply regret the ordeal I have put you through. I recognize my mistakes, and I humbly ask for another chance. I promise to make everything up to you. ♥ Let’s spend the weekend together making up for all the pain of our mistakes that led us to breaking up. I’m sorry and I miss you. ♥ My broken heart is begging me to reach out to you. I will always love you. 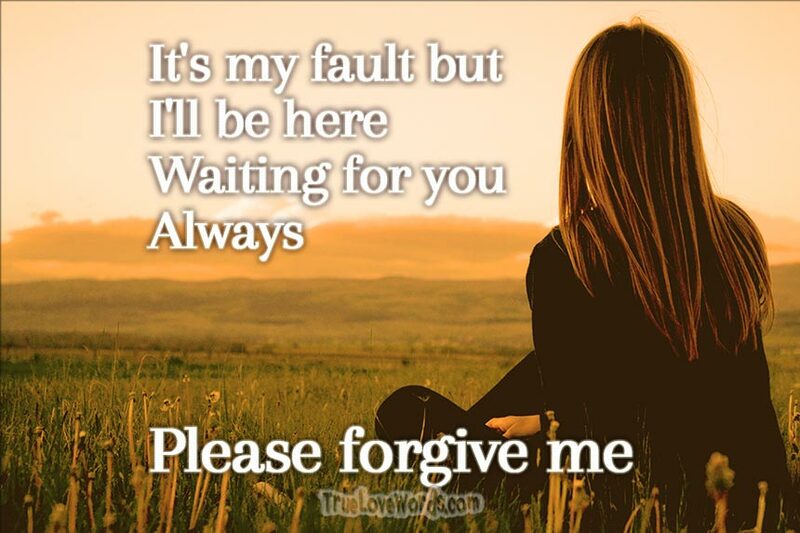 Please forgive me and come back to me. ♥ When you left my heart went with you, and I am empty inside. Please come back so that I can show you how much you mean to me and make up for my mistakes. ♥ Life is about the simple things: the way your smile lights up the room, the way your kiss feels on my cheek. I’m sorry my love, our relationship got complicated. Let’s go back to the way it was. Ever give her heart to mine? Not treasure it like gold? And slowly does it pass. ♥ I’ve written a letter to you in my mind a thousand times, but I can never get the words right. The simple truth is I love you, and I miss you. Please come home to me baby. ♥ My soul is lonely without yours. I need you to forgive me for the little mistakes I’ve done. ♥ My days are filled with anguish and regret because of my foolishness, and my nights are filled with lament for the beautiful love that we shared. I’m ashamed of what I’ve done. I’m really sorry. Please forgive me. ♥ It’s my fault, but I’ll be here. Waiting for you. Always. I’m sorry darling! ♥ Our separation has helped me understand that you are the only one I will ever love. Please let me show you how much you mean to me. ♥ Each tear that you cried made a crack in my heart. Our separation has left me shattered. Please forgive me and help me be whole again. Our love truly mattered. ♥ When you lie down tonight, remember how much I love you. Please don’t get over me. I’ll never get over you. I’m sorry my love. ♥ The space between us is unbearable. Please let me come closer, and I promise to take it a step at a time. ♥ Whenever I hear our song, I smile at memories of you. But when the song fades, so does my smile. I miss you so much. ♥ I live in a black and white world since you went away. You were my rainbow. Please color my life again. ♥ Your name is on my lips, on my heart, and on my mind. I long for you every moment. ♥ Without you, life has no song. There’s no joy in my step, no anticipation in my day. But a tiny flame of hope burns somewhere deep inside, warming me just enough that I continue to pray for your return. ♥ Where is our love, and how did we lose it? If it came back, would we still choose it? I know I would; I search for it every day. ♥ What was I thinking? I wasn’t. I need you back in my life. I’m sorry my love for everything. ♥ Our hearts are bound with the tether of love. Sometimes the strings loosen, and our hearts drift apart. Let’s make a vow to draw them together, and tie a knot that will bind them forever. ♥ My mouth is sorry for the words it spoke. My soul is grieving over the heart it broke. My eyes are hoping to see you again. My heart is hoping to win you again. ♥ If you’re willing to forgive me, I promise to earn your trust. This relationship is worth fighting for. I’m sorry baby I’ve done a mistake. ♥ Could we talk just one more time? There is so much I need to say, so much I need to pray. I’m sorry my love. ♥ It wasn’t supposed to end like this. It wasn’t supposed to end at all. I need you. Please come back to our home. I’m really sorry. ♥ I miss you more than you can conceive. I need you more than you can believe. I love you more than you can receive. All I can do is remember and grieve. I made you leave. I’m asking for your forgiveness. ♥ I watch for you out the window, hoping to spot you in the crowd. When I think I’ve found you, my heart leaps, only to be disappointed when it is someone else. My heart only has love for you. ♥ Your name is written on my heart, and I can never erase it. It will belong to no one else. 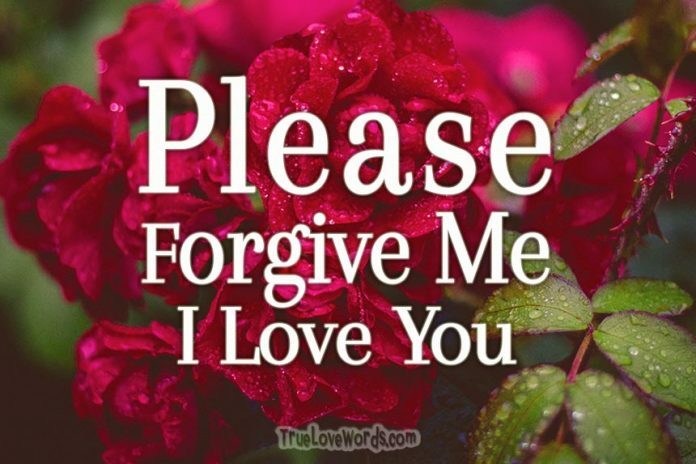 Please forgive my love for the last time. ♥ Only you can touch me without laying a finger on me. You will affect me forever. ♥ The stars spell your name when I look up into the darkness, and in the light of day, your face is in the clouds. The wind whispers your whereabouts, but I can never find you. I vow to never stop searching. ♥ I’ll take the storms and endure the battles, if it means I get to be with you. ♥ The truth is I am nothing without you. You are my inspiration, my hope, my life, and my love. I will always need you. 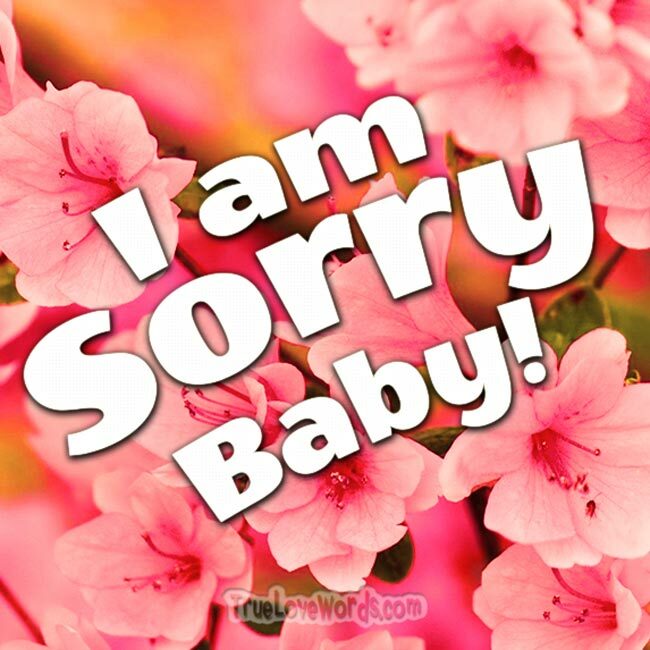 I’m sorry baby. ♥ Your ring is on the counter where you left it, and I can’t bear to pick it up. I feel its cold hardness in my heart, and long for it to be back on your finger where it belongs. ♥ Our love is still here. I found it buried beneath some harsh words and selfish feelings. Let’s dust it off and let it shine again.